The 'Right' Way to Apply Makeup? What a difference the right makeup techniques and colors can make! Will it be clear skin, kissable lips, and glowing cheeks...or total mayhem? This site will give you loads of tips and useful advice. Tips that will make application a little easier and results more polished. You can then get the best out of all those tubes and foundations lining the cosmetics aisle. Flawless faces are not only for stars who carry professional artists in their humongous wallets! Regardless of whether you use expensive cosmetics or shop from the budget beauty store, with good advice, make up is your friend. The only thing you really is the relevant information. Sometimes I wonder how so many companies create the products, but don’t tell you how to actually use it. Lack of information is the reason why you’ll sometimes see beautiful women who’s makeup makes them look worse than clean, un-made up faces. 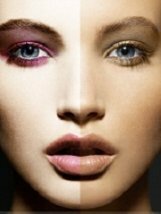 … Purely to emphasize the role that make-up plays in your quest for beauty. Deciding on a look is the easiest part. Going from naturally pretty to 'naturally' whatever you want to be is next. It's always so exasperating when one woman wants another's eyes, lips, or face so desperately that they spend their last dime trying to get it! A little inspiration is okay, but when you feel like you don't like yourself so much that you'll risk botched surgery and financial ruin on changing, its a problem. What you have, is going to be the base for your personal image. Your face is just one component of your personal image, but an important one at that. This involves first taking the lines of your face and colors of your skin into consideration. Then all you do is change up your look using different colors and tenchniques. All while keeping these basics in mind. The path to good results then becomes easier. You use the knowledge you have to choose the right skin products, shape your eyebrows, and decide on the best colors for your face. To create flawless looking skin, you need a foundation that will work well with your skin type, and a color that will melt into your skin. You’re not trying to bring a new color to your face, just trying to smooth out the color and minimize imperfections. 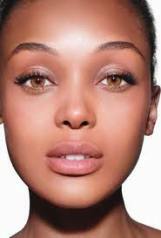 Because we all have different skin types and colors, the starting point for a natural looking foundation is knowledge of your type. So start by defining your type, and then find out what kind of foundation and skincare will actually work best with your own skin. There are different ways to apply different types of foundation and product. Find out the best technique, and you’re more than halfway to your perfect face. I'll often see women with a cakey looking, or flat toned, unnatural face and wonder why they apply so much foundation in the first place. Each product usually has a method that will work best to apply it, and if you use your foundation tools right, you'll get more of the results you want. Now you start bringing out the best in your facial features. You know your face and eye shape, and can trim your eyebrows into their most flattering curve. Your brows are like a frame for the rest of your features. They can also have a big impact on the proportions of your face. So they can slim it up, widen it out, or just make your features look less or more sturdy... So knowing how to shape them gives you an immense level of control over your overall facial profile. Ah, the really fun part! First find out your eye shape. It determines the effects that certain lines and colors will have on your face. Knowing it gives you an idea of the best eye shadow placement. Then you will then be able to apply eye makeup in the most flattering ways possible! This includes the colors that will interact harmoniously with your own eye color. 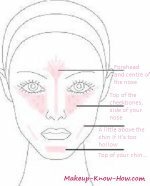 Now you figure your face shape, so that you can use blush for the effect that you want. It's like shading in a picture to give it different dimensions and texture. You'll also discover how to choose the right blush for your skin type and color. Once you know how your skin color interacts with other colors, you'll be able to choose your lippie with confidence. No matter what kind of facial features you’ve been blessed(or cursed) with, THERE’S ALWAYS A WAY TO LOOK AMAZING!